Some days are more special than others. I think I always will remember Saturday, November 17, 2012, unless dementia robs me of it somewhere down the road. Saturday night, one of my daughters, Tabitha, and I took two of my grandchildren to their first college football game. Baylor hosted number one ranked Kansas State in Waco. It would have been a memorable night for Madison (8) and Tristan (5) no matter how the game went because it’s simply pretty amazing to be in a stadium full of 40,000 or so people for the first time. But then the game became a classic, with the unranked Bears defeating the previously unbeaten Wildcats. 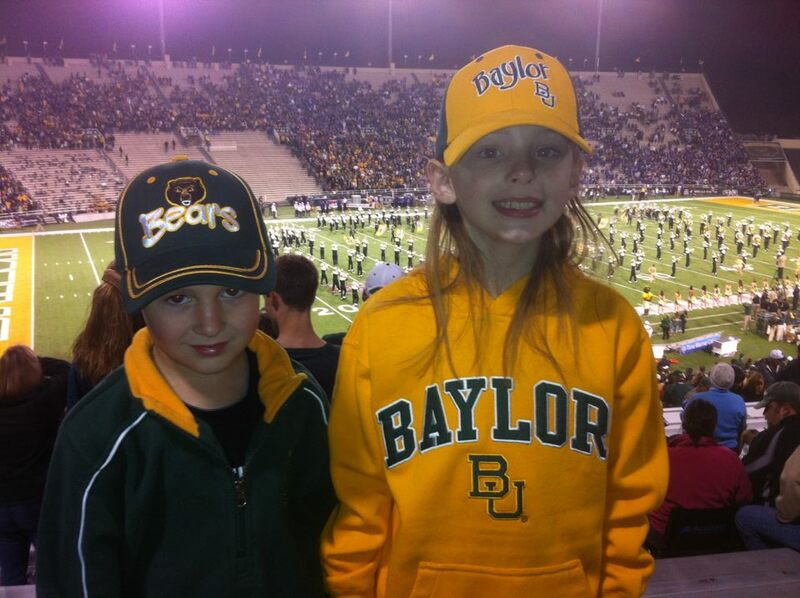 I don’t know if Madison and Tristan had even heard of the Baylor Bears before Saturday, but they were screaming and giving high-fives as if the green and gold were a life-long passion. Madison is not a big football fan; she’s more into the princess thing. But Saturday she found her inner-footballer and raised her Bears “paw” and shouted “Sic ’em, Bears” with the rest of us. Tristan especially got into the game. The south side of the stadium would shout out “B-A-Y-L-O-R,” and our side would respond with “Bears.” Every time it was the moment for “Bears,” Tristan raised his clinched fist as if curling a bum-bell and yelled “Bears,” with a look on his face similar to that of former Bears linebacker Mike Singletary. He did it over and over and over. The day after, my dad told Tabitha he didn’t think Tristan, at age 5, would remember the game. She responded that his son (me) remembered when his dad took him to his first big-time football game at age six–Dallas Texans vs. San Diego Chargers at the Cotton Bowl. Like it was yesterday. Some things in life stick with us for a very long time. We wish we could get rid of some of the bad memories, so maybe adding some good ones is one way to crowd out the bad. It surely cannot hurt. A football game is not very important in the big scheme of things, but just as Jesus took time to go to parties, it’s nice to take time away from the more serious pursuits of life and simply enjoy life with family and friends. The Apostle Paul said, “Rejoice with those who rejoice, weep with those who weep.” (Romans 12:15 NRSV) I rejoiced with my Baylor friends Saturday; I’m afraid I didn’t weep with the Kansas State folks whose hearts were broken. But this is only football, and I’m still a work in progress.